Vastokas, Joan M.. "Contemporary Indigenous Art in Canada". The Canadian Encyclopedia, 29 January 2018, Historica Canada. https://www.thecanadianencyclopedia.ca/en/article/contemporary-aboriginal-art-in-canada. Accessed 22 April 2019. Contemporary Indigenous (Aboriginal) art is that which has been produced by Indigenous peoples between around 1945 up to the present. Since that time, two major schools of Aboriginal art have dominated the contemporary scene in Canada: West Coast Aboriginal art and the Woodlands school of Legend Painters. Contemporary Aboriginal art is that which has been produced by Indigenous peoples between around 1945 up to the present. Since that time, two major schools of Aboriginal art have dominated the contemporary scene in Canada: West Coast Aboriginal art and the Woodlands school of Legend Painters. As well, a more widely scattered group of artists work independently in the context of mainstream Western artand may be described as internationalist in scope and intent. 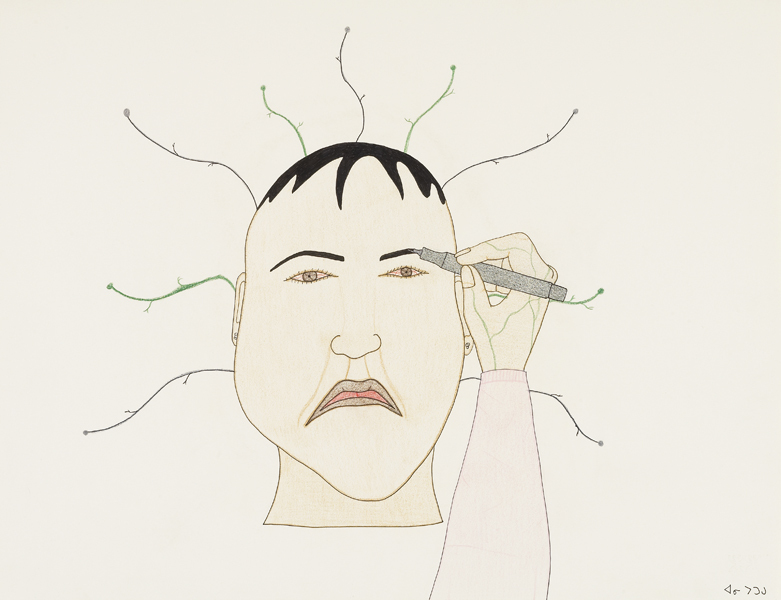 Contemporary Inuit art has evolved in parallel with contemporary Aboriginal art, producing celebrated artists like Zacharias Kunuk and Annie Pootoogook. Black felt pen and coloured pencil on ivory wove paper, 50.7 x 66 cm. Image: National Gallery of Canada, Ottawa/Photo \u00a9 NGC/\u00a9 Dorset Fine Arts. In the late 1960s and early 1970s what some have termed a renaissance of Northwest Coast art in British Columbia occurred with the appearance in abundance of traditional forms of woodcarving, metalwork, painting, prints and textiles at first among the northern nations (Haida, Tsimshian, and Kwakiut) and more recently among the southerly Nootka and the Central Coast Salish. Traditional art work continues to be produced for use within still vital or newly revitalized Aboriginal communities. This is the case in British Columbia, where the carving of totem poles, masks, and other traditional genres has increased since the lifting of the potlatch ban by the Canadian government. That infamous 1884 Federal Bill 87 had prohibited performance of the potlatch, an all-important social and religious feast that required a host of artworks for the dramatic re-enactments of oral history and traditions. Recently, West Coast artists such as Tony Hunt, Bob Davidson and the late Haida artist Bill Reid (1920-98), among many others, have worked within the framework of traditional Northwest Coast art styles and imagery, a tradition that had been kept alive during the potlatch ban by such notable figures as Haida Charles Edenshaw (1839-1920), Willie Seaweed (1873-1967) and Mungo Martin (1879/82-1962) of the Kwakiutl Nation. Contemporary work produced on the west coast continues to be decidedly traditional in orientation. Artists may deviate radically from traditional imagery, forms, and composition, but their work is nevertheless produced within an established range of visual elements and motifs known as the "classic style" of Northwest Coast art, a style which reached its most characteristic development among the Haida, Tsimshian and Tlingit artists in the 19th century.Contemporary art is produced on the coast today for use in Aboriginal villages, but more often such traditional items as masks, rattles, boxes, bowls, textiles and jewellery are adapted to Euro-Canadian techniques, materials, and functions for sale in Indigenous art shops. During his lifetime Bill Reid best exemplified the adaptation of West Coast Aboriginal traditions to contemporary purposes. First known for his silver and gold jewellery - bracelets, rings, and brooches engraved with Haida crests such as Bear, Raven, Frog, and Killer Whale - he became recognized nationally and internationally for his monumental public sculpture. His large wood-carved "Raven Discovering Mankind in a Clamshell" (1983), for example, stands in the University of British Columbia's Museum of Anthropology; a large bronze, "Killer Whale," (1984) is a centrepiece of the Vancouver Aquarium in Stanley Park; and his most famous "Spirit of Haida-Gwaii" (1991) is located at the Canadian embassy in Washington, D.CThis last monumental sculpture, measuring some 6 metres in length by 4.3 metres in height, depicts Haida mythic animals on a spiritual canoe voyage. With its black patina, the sculpture resembles argillite, the traditional stone of 19th century Haida carvers. The production of this work for the Canadian embassy was temporarily halted by Reid as a form of protest against logging by commercial interests in the primeval coastal rainforest of the Queen Charlottes. Reid's protest illustrates the increasing frequency with which Native Canadian artists have moved toward sociopolitical activism, signifying not only a shift toward new functions for Indigenous art, but also increasing participation in the democratic processes of Canadian society at large. The Woodlands school gained recognition in the 1970s with the rise to fame of Norval Morrisseau, an Ojibwa from Northwestern Ontario. The majority of Woodlands artists working from the 1970s into the 1980s were inspired and influenced by Morrisseau and as a group are also known as Legend Painters for their depiction of imagery taken from spiritual and mythological traditions. Independent Aboriginal artists gained attention first in the 1980s and in the 1990s have come to dominate the contemporary art scene, and many of them are now ranked among the leading visual artists working in Canada today. The work of the late Norval Morrisseau and related Legend Painters such as Jackson Beardy, Blake Debassige, and Carl Ray may be located approximately midway between Aboriginal and Euro-Canadian aesthetic traditions. Canvases, sometimes very large, are executed in synthetic acrylic paints, a medium favoured as well by Euro-Canadian artists in the 1960s and 1970s. At the same time, both the subject matter and style of these artists is inspired by traditional Algonquian pictography as found in sacred birch bark manuscripts of the Ojibwa and in the pictographs and petroglyphs of the Canadian Shield region. Morrisseau's sources included also the stained glass windows of his childhood Catholic church and the beliefs of the Eckankar religion, both of which spiritual traditions appealed to his innate Ojibwa mystic vision of the world, first gleaned at the knee of his maternal grandfather, a traditional Ojibwa medicine man. This combination of both traditional Aboriginal and Western arts and spirituality resulted in Morrisseau's work, and in many others of his following, an artistic expression standing between two cultures and appealing to both. A wide network of contemporary artists of Aboriginal ancestry have been producing work that is almost entirely within the Euro-Canadian and international mainstream. These artists are no longer trained in the traditional techniques of particular First Nations, nor are they self-taught, as was Morrisseau. Instead, they have studied in leading art schools in Canada, the United States and Great Britain. Artists such as Carl Beam, Bob Boyer, Robert Houle, Alex Janvier, Gerald McMaster, Lawrence Paul, Edward Poitras, Jane Ash Poitras, Joane Cardinal-Schubert and Pierre Sioui are all individualists who have seen themselves as artists first, but for whom their Indigenous background is an important aspect of their identity. Even so, they take pride in their identity and see their role as artists in a traditional way; that is, they use their art to speak on behalf of their people. Although their works are produced entirely in the Western context of art schools, galleries, dealers, critics, and museums and with the techniques, genres, and modes of expression characteristic of contemporary Western art, their focus is upon making a personal statement about any or all of the social, political, racial, and environmental issues facing both Aboriginal peoples and the wider global society at large. While personal and individual in experience and expression, these artists are nevertheless informed by the spiritual and cultural values of their respective traditions. Critique and sociopolitical activism prevails strongly among these artists, whose works question both the past and present difficult relations between Native and Euro-Canadian society. In particular, they bring to the foreground through word and image the current world crises - ecological degradation, poverty, violence, war, AIDS, - that face humanity at large. The late Carl Beam, of Ojibwa heritage from West Bay, Manitoulin Island, in Ontario, exemplified the independent contemporary Canadian artist of Aboriginal background. 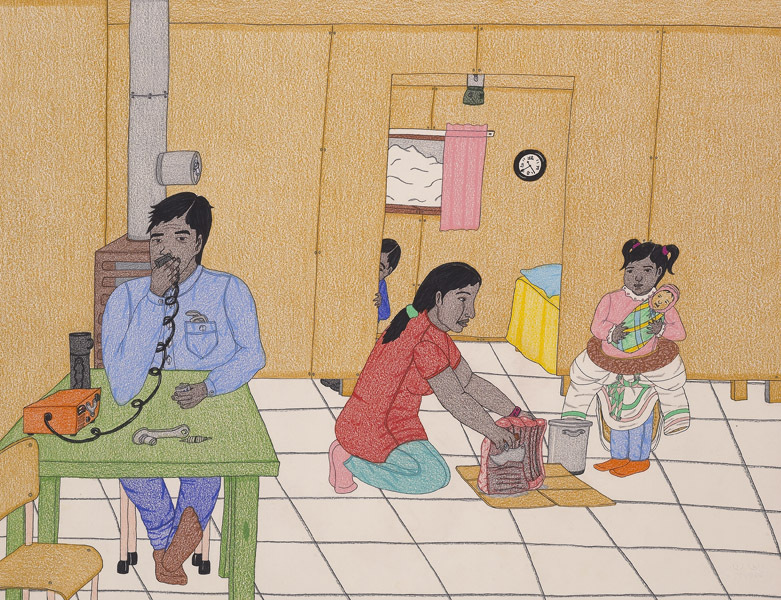 Rejecting the label "Indian artist," his multimedia works spoke with Indigenous values to the wider Canadian and international audience of global issues of survival and human injustice. Working in a decidedly postmodernist vein, his work collapsed forms and images derived from all of the world's art history into one space-time frame. In one work, Semiotica I (1985-89), Beam combined images of a soaring eagle, pre-eminent symbol of Aboriginal spirituality, with those of a Cape Kennedy spacecraft ready for launching, a traffic light and a parking meter. Observers are meant to draw their own conclusions from the work, a feat best accomplished when one becomes familiar with the whole of this artist's creative output.Contemporary work by Aboriginal artists is expanding rapidly into performance art, new media, ivideo, and installation projects. Vancouver-based Ojibway artist Rebecca Belmore, who in 2005 was the first female Aboriginal artist to represent Canada at the Venice Biennale and was one of the winners of the 2013 Governor General ‘s Award in Visual and Media Arts, has undertaken fierce, iconoclastic public performances on themes like the disappearance of Aboriginal women from the streets of Vancouver (Vigil, 2002), mounted elaborate video installations, typically using herself as the chief performer, addressing metaphorically charged themes like water (Fountain, 2005), and has created countless sculptures and photographs that address a wide array of Aboriginal themes. An artist of Cree and Irish ancestry, Kent Monkman (born 1965) has staged elaborate pageants in bright, feather costumes that look like a cross between a drag queen contest and a religious ritual, painted historical panoramas in the 19th century Hudson River School style, and made videos, all deploying his perverse and funny alter-ego Miss Chief Eagle Testickle. Born in Fort St. John, British Columbia in 1970 of Cree and Swiss ancestry, Brian Jungen, whose work has received major surveys at the Tate Modern in London and the Vanouver Art Gallery and who is a recent recipient of the Gershon Iskowitz prize at the Art Gallery of Ontario, uses the ordinary objects of popular culture and everyday life to create intensely crafted works that address Aboriginal issues in the larger context of global consumer culture. In Prototypes of New Understanding, for instance, Jungen sewed parts of Nike Air Jordans into Northwest Coast style masks, and in Shapeshifter (2002) and Cetology (2003) he built massive, to scale whale skeletons out of white plastic lawn chairs. 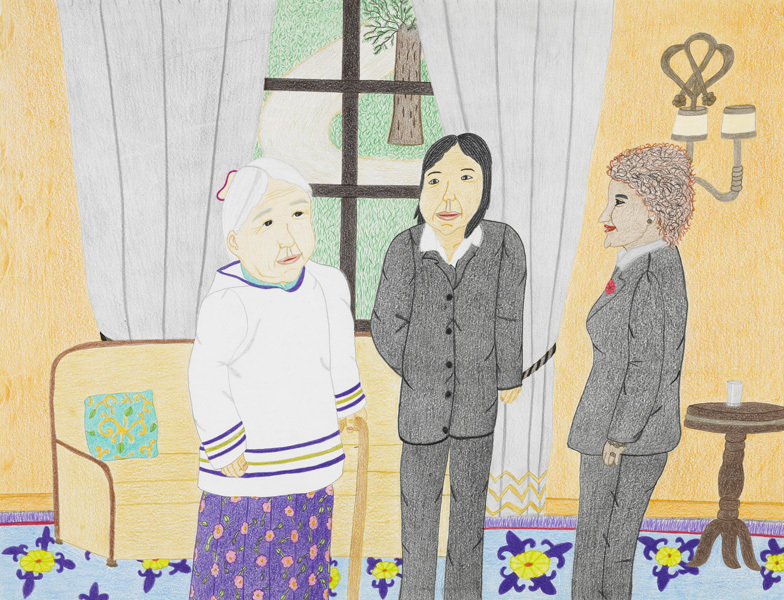 As among other Canadian artists of the late 20th and early 21st century, those of Aboriginal background continue to produce works that express concern for society as a whole. As Indigenous people, these artists help bring authenticity, conviction, and often direct personal experience to the empowerment of their visual representations. Vastokas, Joan M., "Native Art as Art History: Meaning and Time from Unwritten Sources," Journal of Canadian Studies, Vol. 21, No. 4, pp. 7-36. The website for the Canadian Aboriginal Writing and Arts Challenge, which features Canada's largest essay writing competition for Aboriginal youth (ages 14-29) and a companion program for those who prefer to work through painting, drawing and photography. See their guidelines, teacher resources, profiles of winners, and more. From Historica Canada. Explore some of the finest Canadian art on display at the McMichael Canadian Art Collection in Kleinburg, Ontario. Rebecca BelmoreThe website for multi-disciplinary Anishinabe artist Rebecca Belmore. View images and videos of installations and performances. Click on images for a magnified view. Also see the curatorial essay on the major themes and vision expressed in her art.